Happy Days Goat Dairy was founded in 1993 by Donat Koller and his family. Raised on a small family farm in rural Switzerland, Donat knew from a young age that he wanted to farm. Donat graduated from Agricultural College and thereafter took up work farming in Australia and Switzerland. It was back in Switzerland, while working on a dairy farm milking cows and goats that Donat began to experiment making cheese and realized his passion for cheesemaking. After making the famous " Swiss Cheeses" while working at several Swiss cheese plants, Donat enrolled in Cheesemaking College, graduating in 1993. After college he was ready to set out on his own, but realized the opportunities for Cheesemakers in tiny Switzerland were scarce. Donat emigrated to Canada with his wife in July of 1993. They leased a small vacant dairy farm in Salmon Arm, BC and decided that Goat Dairy was the direction to take with the business. One reason, was the high price for cow milk quotas for new farmers. Another, the clear opportunity to service a niche market and produce 100% Canadian goat dairy products. That year, Happy Days Dairies opened for business with a herd of 70 goats, a mobile processing plant, and approval from the BC Government to sell Happy Days goat dairy products in BC. The name Happy Days Dairies, was inspired by Donat's wife Jasmine, who would sing the gospel song Oh, Happy Day with her family at church and after meeting Jasmine, Donat was known to sing it once and a while too! Jasmine's father was a very engaging Minister, and her mother a fantastic gospel singer, together they brought the American style gospel music to the very traditional Swiss churches. The song Oh, Happy Day has been sung by many different musicians over the years and was even a Billboard hit in the 1950's with another non-gospel version of the song which was very popular with teens at the time. Meanwhile, Back On The Farm..
Business was going well, people were very welcoming of the new goat milk product line and accounts were set up all over the Okanagan with independent grocery stores, specialty food stores, Safeway and Overwaitea. With sales and demand building It was time to expand the operation. Donat bought his own property and made capital investments in the operation, building a permanent processing plant. A decision was made to focus full time on processing and marketing. 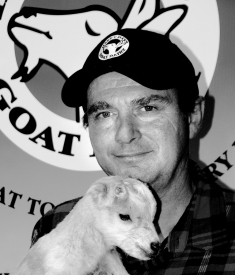 Donat sold his herd of goats to another local Salmon Arm goat farmer who became the first Happy Days goat dairy supplier. The larger plant became Canadian Food Inspection Agency (CIFA) approved opening up the market for Happy Days produts across Canada. 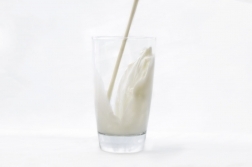 Soon Happy Days milk was available across BC and then Western Canada. To continue to meet demand and stay true to Happy Days mission of being a local producer, additional plants were set up in Chilliwack, BC and Ponoka, AB. Today, the Goat dairy industry is growing in Canada like never before and Happy Days Dairies is committed to producing the highest quality, 100% Canadian, pure and natural goat dairy products because ....You've goat to have the very best!